In September 2009 the Slip-it® fastener was awarded an Invention of the Year Award 2009. The award was given by the Wessex Round Table of Inventors (WRTI) which was formed by entrepreneurs, innovators, and inventors. The award was judged not just on the innovative design, style, and technical merits of the new fastener but also on the commercial potential of the new fastener. Nigel Coole said he was particularly pleased to receive the award from one of the UK's most prestigous innovation societies. 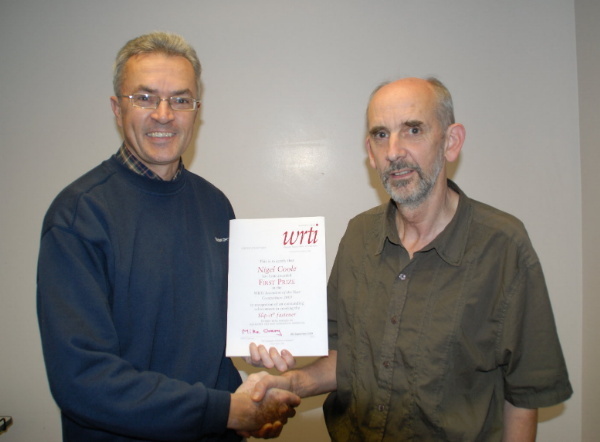 The picture below shows Nigel receiving his certificate from Mike Overy, Chairman of the WRTI. Marc Koska is the brains behind the K1 auto-disable syringe that is helping improve the health of millions of people around the world. Marc thought the Slip-it® fastener was a fantastic idea. He also very kindly spent a lot of time giving Nigel practical advice, based on his own very recent experiences, on how best to manufacture the Slip-it® fastener, bring it to market, and to ensure that it is a success. 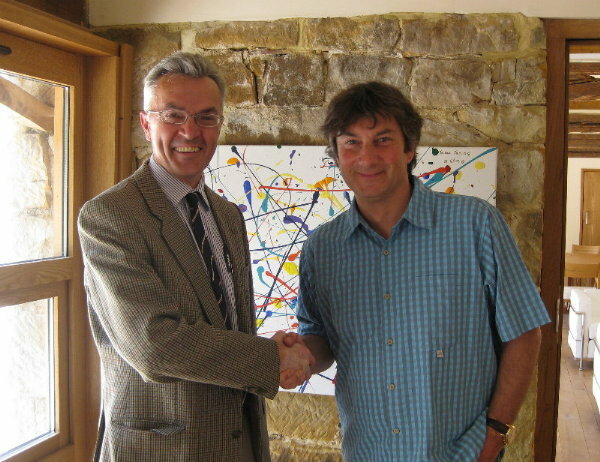 The picture below was taken when Nigel Coole met Marc Koska of Star Syringe Ltd in May 09. Coole Solutions Ltd was formed in early 2010 as the vehicle to take the Slip-It® bra fastener and lingerie fastener into full scale commercial production. Shortly after forming the new company, the CAD design (for tooling) was finalised and a UK based manufacturer selected to produce the sample tooling. The tooling was commissioned in May 09 following which samples were tested and the design refined to take into account the results. In early 2007 Nigel Coole realised that the old fashioned hook & eye bra fasteners were long overdue replacement. The inspirationl moment came whilst watching one of the American high school type films, either one of the 'American Pie' series or the 'Animal House' films. Basically, one of the plots was girl loves boy, boy loves girl, but it never happens between them until the end of the film. Cue romantic scene; they are finally together, alone, and all is going well until the boy simply could not undo her bra and as a result of that the moment was lost and nothing happened! Nigel suddenly realised that that was happening around the world, everyday, and it must be possible to invent a fastener that was easy to do up and undo! As soon as he started to research the idea it was clear from the women he spoke to that not only are the old fashioned hook & eye fasteners difficult to do up and even worse to undo, but they also had many other drawbacks including damaging other clothing in the wash, and they are the most ugly component on a garment that is designed to be supportive and very importantly, beautiful. In true English fashion Nigel went out into his garden shed and made the first prototypes out of materials readily to hand. As he is not an engineer or previously involved in manufacturing, he got a strip of brass, cut out the pieces, filed them down and soldered the components together with a mini burner and plumbers solder to create the first prototypes! 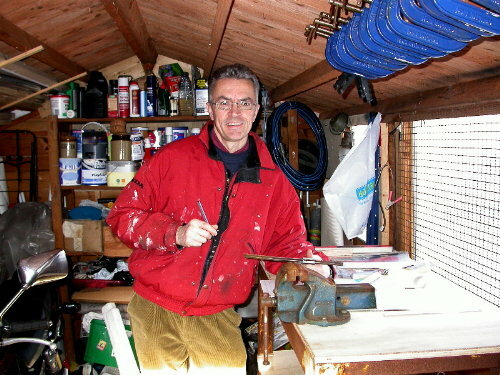 The picture below shows Nigel in his shed as he starts to make the very first prototype. Please excuse the scruffy attire but it was January and the shed was freezing! Even though he was totally confident that the idea would work, it was a great relief when the two parts of the fastener slipped together and worked just as he had hoped. As the fastener had to be small enough to go on the back of a bra, it was also necessary to make larger demonstration models out of bits of plastic and glue them together so he could show and explain the idea to others. It was obvious from the start that this was a truly global product so Nigel engaged a Patent Attorney and subsequently filed UK and International Patent applications.